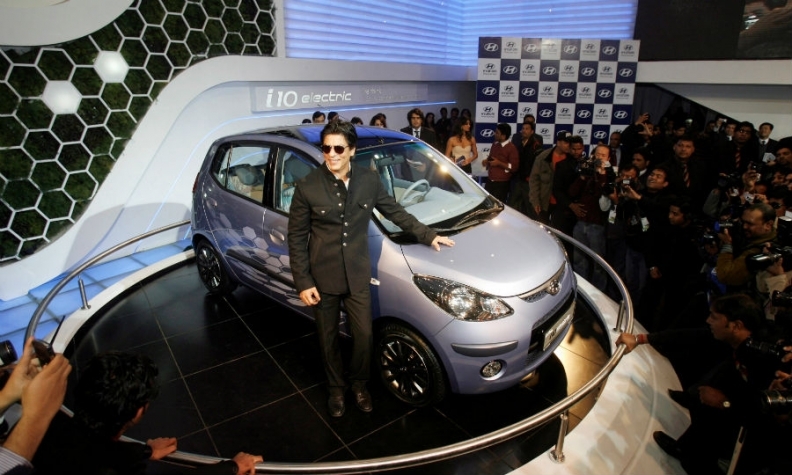 Bollywood actor Shah Rukh Khan poses with a Hyundai i10 electric car at the 2010 New Delhi auto show. A government report recommends electrifying all vehicles by 2032. NEW DELHI -- India's most influential government think tank has recommended lowering taxes and interest rates for loans on electric vehicles, while capping sales of conventional cars, signaling a dramatic shift in policy in one of the world's fastest growing auto markets. A draft of the 90-page blueprint, seen by Reuters, also suggests the government opens a battery plant by the end of 2018 and uses tax revenues from the sale of gasoline and diesel vehicles to set up charging stations for electric vehicles. The report's focus solely on electric vehicles marks a shift away from the current policy that incentivizes both hybrid vehicles - which combine fossil fuel and electric power - and electric cars, and is worrying some automakers. Officials acknowledge the blueprint faces challenges. High battery costs would push up car prices and a lack of charging stations and other infrastructure means carmakers, who have been consulted on the proposals ahead of publication, would hesitate to make the necessary investment in the technology. "If we accelerate electric vehicle growth it will be a disruption for the auto sector and would require investment, but if we're not able to adapt quickly we risk being net importers of batteries," said a government source involved in the plans. "There has been resistance from carmakers." India's top-selling automaker Maruti Suzuki has invested in mild-hybrid technology, which makes less use of electric power than full hybrids, while Toyota Motor Corp. sells its luxury hybrid Camry sedan in the country. Mahindra & Mahindra is the only manufacturer of electric vehicles in India. The new Niti Aayog report, co-produced with U.S. consultancy Rocky Mountain Institute, outlines a 15-year plan, broken into three phases starting in 2017. Other suggestions in the blueprint include incentivizing the use of electric cars as taxis by lowering taxes, interest rates on loans for purchases and electricity tariffs for fleet operators, and lowering duties on makers of such fleet cars. Puneet Gupta, South Asia manager at consultant IHS Markit, said the government would need to lead the change with generous incentives to achieve its goal. "This is one of the most radical changes the government is talking about," said Gupta. "All cars being electric is a distant dream."